The comments of Singh, Union Minister of State for External affairs, drew sharp criticism from the opposition, including the Congress, which demanded his immediate sacking. The opposition demanded the resignation of Union Minister Gen V K Singh and the registration of a case under the SC/ST Act against him for allegedly using “casteist” and “inhumane” remarks Thursday while attempting to delink the Central Government from the murder of two Dalit children in Haryana. Responding to a question on the killing, Singh told reporters in Ghaziabad: “Kabhi sthaniya ghatnaon ka sarkar se talluk mat rakhiye. Uske upar inquiry chal rahi hain. Parivaron ke beech mathbhed tha.. voh mathbhed kis roop mein parivartit hua, kahan par intazamiyan ka failure hain, administration ka? Uske bad voh sarkar ke upar aata hain (Never associate local incidents with the Central Government. There is an inquiry going on. There was a dispute between families. The dispute…how did it turn out…where did the arrangements fail, the administration? He added: “To har cheez par, ki wahan par pathar maar diya kutte ko to, sarkar jimmewaar hai. Aisa nahi hai. (For everything…like if somebody throws a stone at a dog, then the Central Government is responsible…it is not like that)”. Singh’s reference to the dog triggered demands for his resignation from the Congress, the Left parties and the Aam Aadmi Party (AAP) and CPI(M), which also sought registration of a case against him under Scheduled Castes and Scheduled Tribes (Prevention of Atrocities) Act. “Today is Dussehra. If (Prime Minister Narendra) Modi wants to celebrate Dussehra, he should get rid of evil and arrogance from his Cabinet. He should remove VK Singh from his cabinet by evening,” Delhi Chief Minister Arvind Kejriwal tweeted. “AAP will go to the police station tomorrow to file an FIR against Gen V K Singh demanding his arrest as under the SC/ST Act, the offence is non-cognisable,” senior AAP leader Ashutosh said. Congress leader Randeep Surjewala described Singh’s comments as “shocking, condemnable and inhumane”. 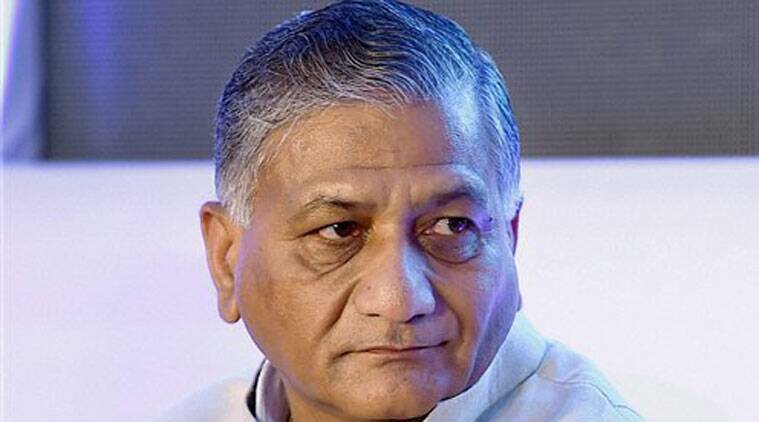 “General V K Singh has insulted not only the entire Dalit community of this country but all Indians,” he said. However, in a series of tweets, Singh later sought to clarify his comments and said they were “trivialised”. The BJP also came to the defence of Singh, saying his comments should not be blown out of proportion. CPI(M) politburo member Brinda Karat described Singh’s remarks as “arrogance of casteism” and demanded the registration of a case against him. “His statement is a clear casteist statement and it comes under the provisions of the prevention of crime against SC Act,” she said. The CPI said Singh’s remarks were “visible signs of emergence of cultural fascism” in the country.